The ancient Scottish town of Dunkeld has been base for hundreds of thousands of River Tay salmon fishing visitors over the decades and will no doubt remain as popular going forward. Part of the attraction of Dunkeld is the close proximity of some of the best River Tay salmon beats and none more so than the Dunkeld House beat. The Dunkeld House beat commences from the upstream side of Dunkeld Bridge and extends for a further 1.5 miles. This water is true salmon 'holding' water due to its depth and partially slow moving flow rates and holds fresh run salmon from the Tay's 15 January opening day right through to the end of the season. The beat is also fortunate to have some amazing fly holding water at both its upstream and downstream boundary areas which are also first class and give a 'genuine chance' of a salmon on the fly. With a change of beat ownership in the last few days there are huge plans for the beat in the immediate future that are very exciting. Part of the plan is to build a brand new luxury fishing hut at the tranquil & peaceful upstream Rock Pool location. An additional beat operating policy that will be actioned is the 'over due' concept of introducing proper pool 'segregation' for fly & spin fishers on the Tay as this beat is very fortunate to benefit from both types of fishing water. 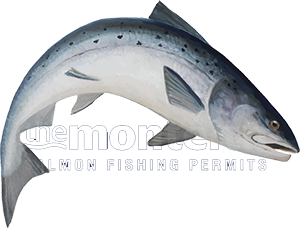 Better beat marketing presentation and teaming up with the owners of the Dunkeld House Hotel for competitive accommodation packages for all visiting salmon fishers is also high on the list of immediate priorities. New traditional Tay coble boats handbuilt by John Ferguson at his Stanley workshop have been ordered and new Yamaha 8 horse power engines have already been ordered too. Riverbank improvement initiatives are currently being carefully considered with my colleagues at SEPA and SNH and their habitat restoration partners The River Restoration Centre. A new all 'singing & dancing' dedicated Dunkeld House beat website will soon be built with amazing new 'perfect light' shots of the beat from all seasonal angles. The most important component of this entire project is the re-pairing with my best buddy and fellow professional River Tay salmon guide Gordon Pollock who has now been re-appointed on Dunkeld House as 'Head Ghillie'. Gordon is without doubt the only man in Scotland for this fantastic role. I'm personally convinced Gordon was an otter or osprey in a past life as he has a serious nose for catching salmon and is a true expert in all 'riverbank & boat' salmon fishing tactical approaches. The first day I met him on the River Tay I could see his amazing salmon fishing skills as a salmon 'head & tailed' in front of us. Within 10 seconds the fish was hooked with a perfectly presented cast by Gordon. Since then Gordon has worked professionally on many of the Tay's famous beats and is delighted to be going back to his favourite former Head Ghillie position at Dunkeld House. Tracking forward 15 years from when we first met I can think of no other professional ghillie on the Tay with as much unfloundering enthusiasm, absolute fishing skill and a total sub surface understanding of Scottish salmon and how to interview them. I can also think of no other who is as skilled and persistent on a daily basis with the recently accepted world of 'social media'. Basically I'm 'over the moon' at the prospect of working professionally once again with my best chum and 'well renowned' expert River Tay ghillie. If you thought Dunkeld House was a well run & productive River Tay salmon fishing venue before now then watch this space as big plans are in the pipeline to take the beat to an even higher level of professional salmon beat operation. Follow this link for more information on the Dunkeld House beat of the beautiful River Tay. We look forward to demonstrating total salmon beat 'brilliance' to all visiting salmon anglers over the forthcoming years on the Dunkeld House beat.